In April 25, 1977 an extraordinary case of UFO abduction took place in Pampa Lluscuma Chile. The case was called “The Valdes case” and up to now is one of the most intriguing cases of extraterrestrial abductions, this UFO case is well documented and there were many witnesses back then, although it’s also unknown to many people as well. We asked about this strange case and the answer given by the Masters of Light surpassed Science fiction. Interlocutor: A person asked me about the Cpl. 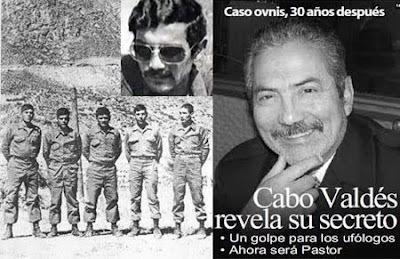 Armando Valdes who disappeared suddenly before of six members of the army patrol and when he returned 15 minutes later he had about a week’s growth of beard. What did it happen to this person? Ruanel: He was abducted by aliens and he traveled through time in the process. Interlocutor: Was he abducted by extraterrestrials of this time or from the future? Ruanel: They were extraterrestrial of this time and the Cpl. Valdes was transferred to the past. Interlocutor: Let’s see if I understand. Did they abduct him and then their ship traveled through time into the past? Ruanel: Yes, he was unconscious, and they made certain experiments on him. Interlocutor: How many days did he go to the past? Interlocutor: So, the long of his beard when he returned was in fact a growth of 18 days? Interlocutor: I don’t understand the idea. Wouldn’t it be logical that his organism, including his beard had returned to the same condition he was at the moment of being abducted? Ruanel: No, not at all. Let’s suppose that you are with me today and I have a time machine, Then, I take you 18 days to the past and I leave you far from your house. I say this because if you returned to your house, you would find with yourself of 18 days ago. Ruanel: Then if 18 days have passed, you would have a beard of 18 days! Interlocutor: Let’s see if I understand: they abducted the Cpl. Valdes, they experimented with him, they transfer him into the past and then they brought him back leaving him in the same place where he was abducted and he appeared with a long beard. I don't really understand well because something is missing. Ruanel: The fact that you lack is that they abducted him and they made experiments with him while the whole ship with its crew members traveled 18 days to the past. Interlocutor: Did the ship itself travel into the past? Ruanel: Yes, because it was a space ship that had the necessary technology to travel through time. Interlocutor: What kind of experiments did they make with him? Ruanel: They induced him things in his mental decoder to see how he would react, they put on his body apparatuses of measurement. Interlocutor: And how did they feed him? Ruanel: They fed him through tubes. Interlocutor: Then the time travel into the past has nothing to do with the experiments they made on him? Those who abducted him are extraterrestrials that have their time limited, they travel to very distant planets, we are speaking of more than 1000 light years, then, their missions have to be short so in order to take advantage of time, they travel back in time to the past. For example, they arrive today, they travel back in time one month and during that whole month they accomplish their mission, so when they finish their tasks they are in the same day they arrived and they didn’t waste their time. Interlocutor: I can hardly believe something so fantastic! Ruanel: You find it difficult to believe because here on Earth there is nothing similar, if there were something like that, you would find it as a routine. Interlocutor: Well, I will summarize it to see if I understood everything correctly. These extraterrestrials abducted the Cpl. Valdes to their ship and while they made experiments with him the ship went back 18 days into the past, after those 18 days they returned him to the place he was before, but for him had hardly passed some minutes. Ruanel: For him 18 days have passed. Few minutes have passed from the psychological point of view, because during the whole abduction he was practically unconscious. Interlocutor: What I don't understand is this: the Corporal says that he will write a book. How will he write about his experience, if he doesn't know what happened to him? Ruanel: He will write it, but he will make everything up. It will be a completely commercial book; many people have done it before narrating facts that never happened. Interlocutor: Naturally that the spirits of error will "help" him. Ruanel: Don't doubt it for a moment. According to the witnesses the watch of Cpl. Valdez was marking the date 30 April 1977, and it stopped, it’s obvious that the watch didn’t mark the other 13 days missing. This entry was posted at Tuesday, December 29, 2009 and is filed under Extraterrestrials . You can follow any responses to this entry through the .